Dark Seed tells the haunting story of writer Mike Dawson who moves into a new house in a small american town. During his first night in the house, he dreams a terrifying nightmare about dark forces planting an alien embryo inside his head. When he wakes up the next morning and suffer from an extreme headache, he quickly finds out that the nightmare is very real and happening to him right now. 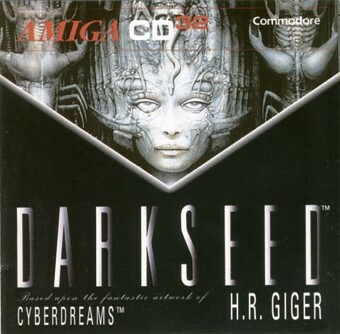 Dark Seed is a graphical adventure game from Cyberdreams, and this is their debut release. It's a simple 2D point'n'click game, similiar to Monkey Island where you move around and gather items for later usage. The whole game is real time, which is both cool but also frustrating sometimes. For example, if you don't answer the telephone when it rings, then you might miss an important event, which makes it impossible to complete the game. The graphical part in Dark Seed is very well done. The nightmare parts, or the dark world, is all based on paintings by famous artist H.R. Giger (who created the alien worlds and concept art for the first 'Alien' movie). The music is a little repeative, but still good and fits the game. There is also dialogue speech through the entire game, meaning you get to hear all characters speak (not something very common in Amiga games). 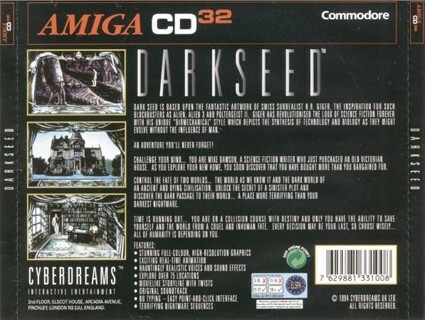 Dark Seed is in overall an interresting horror adventure, with many haunting rooms to discover. The gameplay is a little illogical at some stages, but you can always use a walk-through if it gets too frustrating. You still wanna explore further.